Free to Play Plants vs. Zombies, start your free game now (2016). Description: Zombies are invading your home and are after your brains! 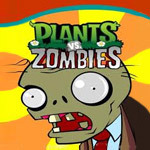 Thankfully, you have your arsenal of plants to defend you in Plants vs. Zombies! Armed with a garden full of peashooters, melon-paults, and cherry bombs, you`ll need to think fast, and plant faster, to stop the different types of zombies dead in their tracks. Obstacles like a setting sun, creeping fog, and a swimming pool add to the challenge and make sure the fun never dies in this addicting Action/Strategy game!